"The discovery of the 'I particle' as envisioned by H.H. Swami Isa and the GEP will be the starting point for the reunification between West and East ; materialism and spirituality. This will bring awareness to the center of all aspects of society and life." 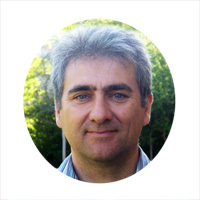 Dr. Christophe Dumas was born in 1967 in Marseilles in the south of France, where he completed his studies as an engineer in energy systems and heat transfers and PhD in fluids mechanics. He started his career as a technical study engineer for nuclear waste management in the French producer electricity company (EDF). In 1997 Dr. Dumas was head of an engineering agency specialized in nuclear science. In 2001 he became a project manager in France's CEA (Atomic Energy Commission) where he worked on nuclear waste management and dismantling nuclear plants. Currently, Dr. Dumas is head of the Solar Thermal Department in CEA Cadarache. He designs and operates solar plants to produce electricity, hydrogen, cooling systems and desalination units. Dr. Dumas is directing the Global Energy Parliament Research Centre and its projects on renewable energy including the use of sound to produce electricity.